I was told Restaurant Extra Super Tanker is already fully booked on Chinese New Year Eve (18 February 2015) so if you are thinking of having your Reunion Dinner there, you may have to look elsewhere. But, for other days during the Chinese New Year, tables are still available. We had a CNY dinner there last year and looking at their line-up this year, it’s likely we’ll be repeating it this year! Chef Ah Wah Koh does not believe in doing too many set menus for the Chinese New Year. SO there are only 3 festive menus, priced at RM1,138 net, RM1,688 net and RM2,328 net (for table of 10). If you have less than 10 people, it is possible to scale down the portions and price as well. 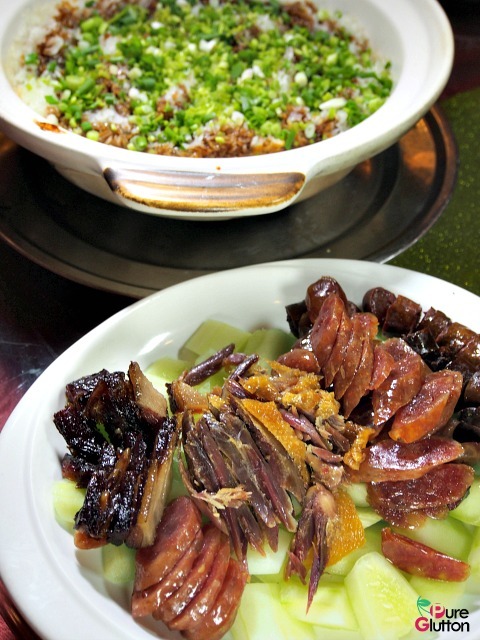 It is the Chinese New Year, so you can be sure that all kinds of “prosperity” ingredients will make up the dishes. Be prepared to feast on yee sang, tiger prawns, scallops, dried oysters, Iberico pork, fish maw, abalones, fresh fish and of course, the must-have rice with premium waxed meats. The thing with Chef Ah Wah Koh’s dishes is that there’s no pretentiousness about them. You get honest-to-goodness wholesome dishes, put together using only quality premium ingredients. I had a preview of some of those specialities recently. To kick off dinner, a platter of fried dumplings was placed before us. They looked a bit ordinary, just like any fried sui-kow but these were quite rounded, a clear indication of their generous fillings. True enough, when I bit into them, the sweet bouncy fresh prawn meat took me quite by surprise, in a very good way, of course. I was told only live tiger prawn meat is used, none of the frozen kind. 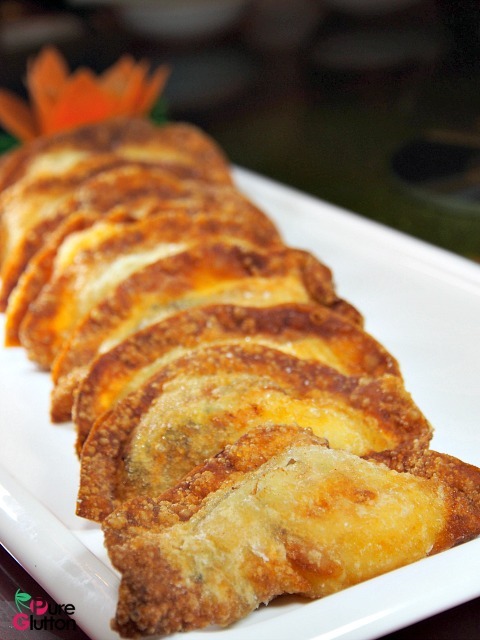 Known as “Prosperous Fatt Choy Dumplings”, they are priced at RM8/piece and are perfect as a simple appetizer item. Chef Ah Wah Koh is a wizard with steamed fish and for a unique twist this year, he presented a Steamed Red Snapper with Kim Chi. 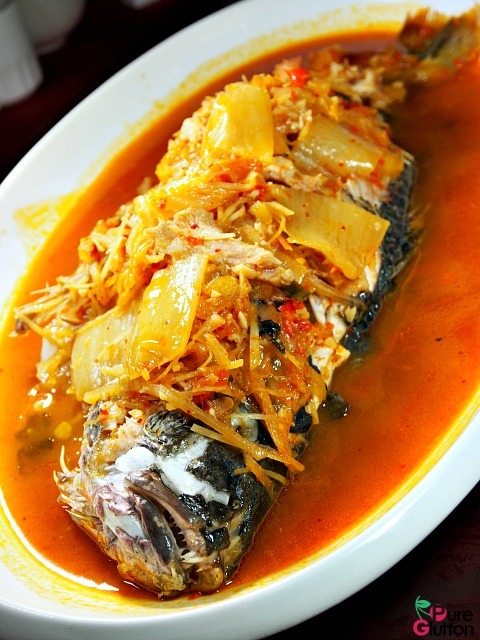 A whole red snapper was smothered with bright orangey red kim chi. The sourish notes were tweaked with some fermented bean paste for an earthy touch and this elevated the overall tastiness of the flavours. The robust flavours call for some white rice to absorb them, unless you are a true-blue kim chi fan. The fresh red snapper goes for RM10/100g. 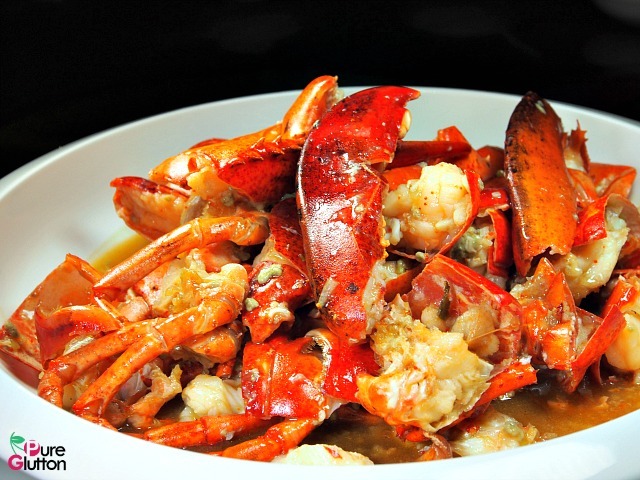 The next dish – Braised Boston Lobster in Ginger Wine brought big smiles all round. 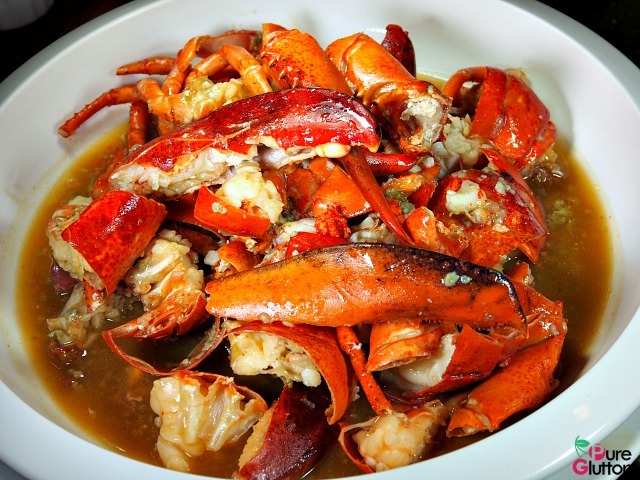 I mean, who can possibly resist those bright red chunks of lobster coated in the most divine ginger wine, kept hot in a claypot? The piquant gingery notes and hearty wine have seeped deliciously into every crack of the lobster pieces and not a single drop was left in the claypot when we were done with this. 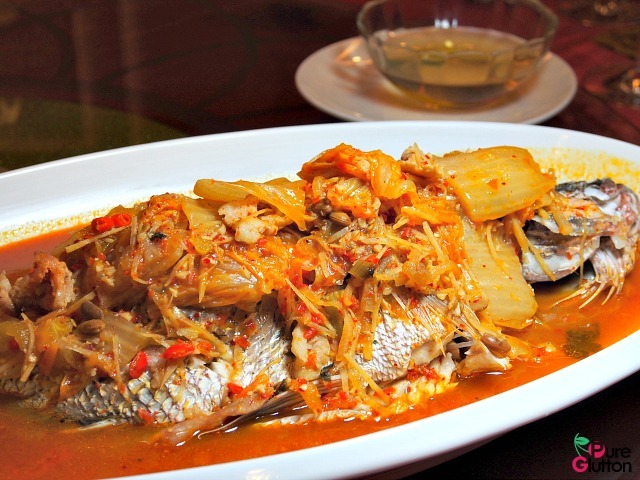 The good chef uses only the world famous Stone’s Ginger Wine for this dish. 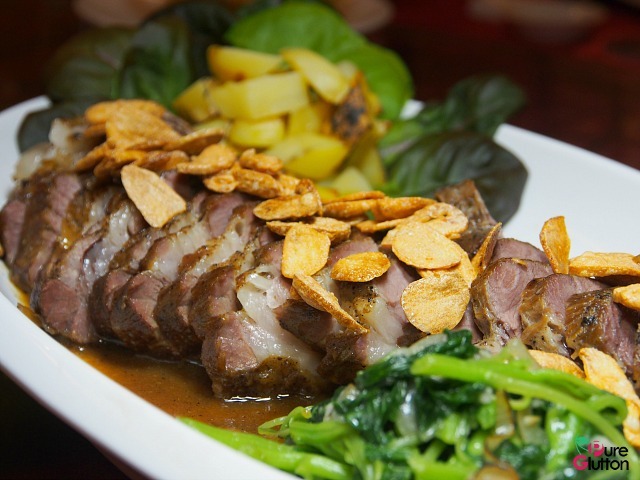 Iberico pork has always been a popular item in this restaurant and being Iberico, be prepared to pay premium prices. 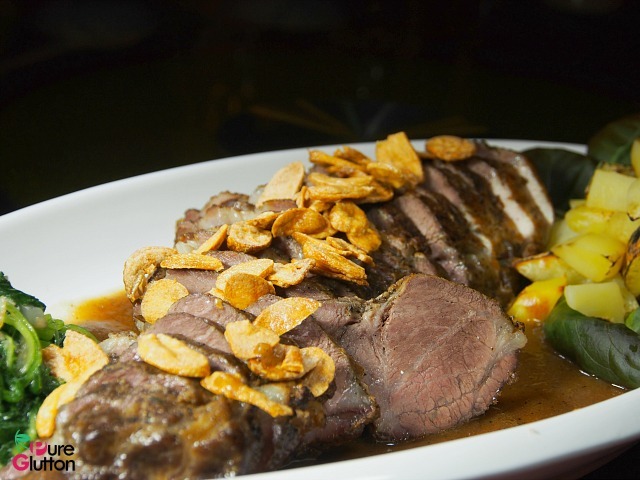 We had a to-die-for slab of Baked Iberico Pork Shoulder with Black Pepper Sauce. Sprinkled with garlic crisps and sides of saute’ed vegetables and baked potatoes, this was certainly an unorthodox CNY dish. But then, who cares when the pork tasted as divine as this? Skilfully executed, the slightly marbled pork was tender yet yielded a nice delicate chewiness – a contrasting masterpiece that can only be achieved by Chef Ah Wah Koh. 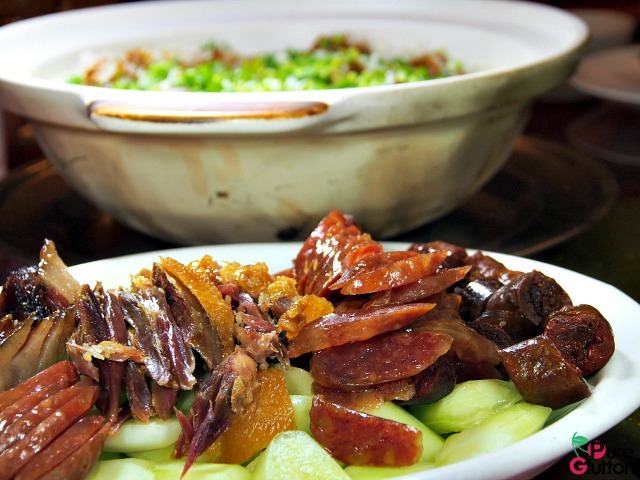 A good pot of Claypot Rice with Waxed Meats is not only a test of skills, it’s also a test of patience. Boiling raw rice grains in a claypot requires a delicate balance of heat and time to yield perfect results and you get this at Restaurant Extra Super Tanker. The rice crust at the bottom was nicely charred and my fellow diners fought each other to get a scoop of that. Mix charred portions with the rice and aromatic waxed meats and don’t be surprised if you find yourself going for a second bowl. 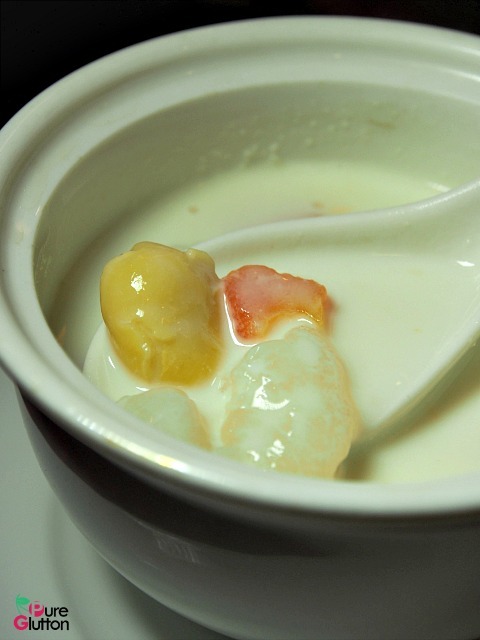 Double-boiled Almond Milk with with Hasma and Papaya is a typical Cantonese dessert. 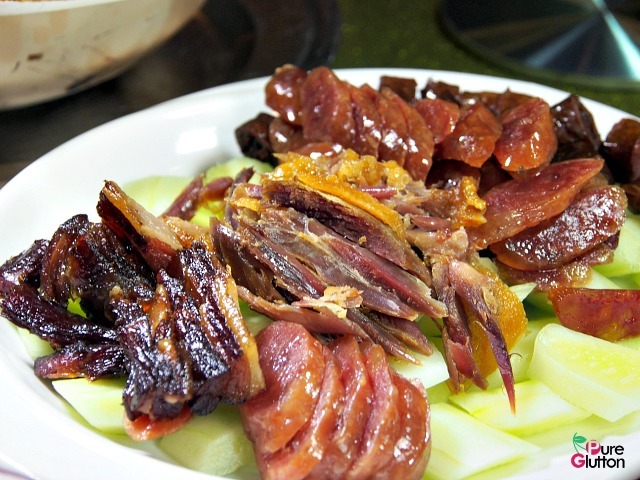 This, together with double-boiled snow pear and nian gao with yam are just about the desserts available during the busy Chinese New Year period. During the 15-day Chinese New Year period, there will be 2 sessions of dinner served, ie at 5.30pm or 8.00pm. Do book ahead and specify which session is preferred.